Sadly, summer is coming to an end and one week remains of Cadance’s summer session. But just because fall is around the corner and everyone’s going back to school, doesn’t mean the fun needs to end. Ring it in with our exciting new show and continue the fun honing your dancing skills, creative spirit, and mind-body connection with Cadance’s fall session…. 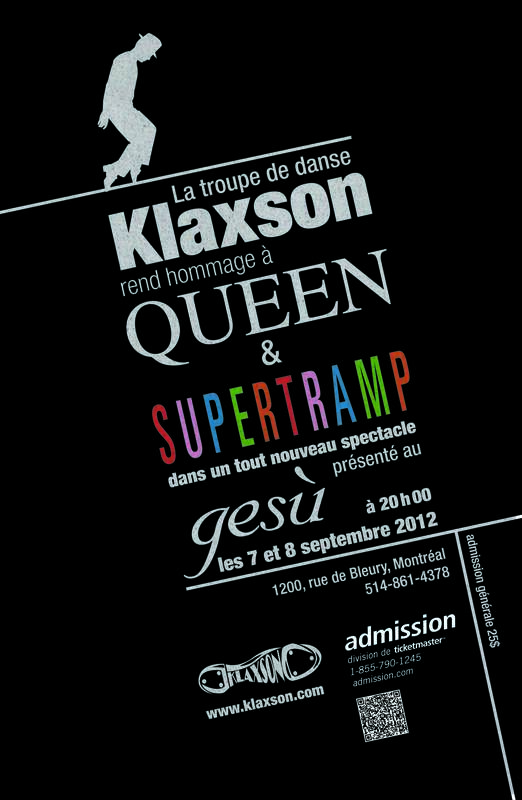 Coming soon to Gesù (Friday, September 7 and Saturday, September 8 at 8:00, to be more precise): KlaXson (featuring Cadance) pays homage to Queen and Supertramp! This is a show you don’t want to miss with an excellent soundtrack and exciting new choreography!!! Be sure to contact me for tickets so you can save on the service charges or you can purchase directly through the Admission Network. Earn FREE Classes If you have taken classes with Cadance before, bring one new student to class and you will receive that class for free. If that new student registers for the session, you and your friend will receive 2 FREE classes each! Early Bird Special Register and pay for the fall 2012 session (in person or online through PayPal) by Friday, August 31, 2012 and save 15%. Fitness Package When you register for BOTH Pilates and GROOVE for the 15-week session pay only $240($10/class for Pilates and $6/class GROOVE). It’s wonderful how all the arts are blending together. What better music to dance to than Supertramp! I saw their co-founder, Roger Hodgson, in concert last week and am still thinking about that amazing show. It was great to see people of all ages dancing and singing their hearts out. What a night. See the original singer/songwriter of Give a Little Bit, Breakfast in America, The Logical Song, Take the Long Way Home, Dreamer and more! I saw on Roger’s Facebook page (http://www.facebook.com/RogerHodgsonOfficial) that he is currently on his largest US tour in 30 years! So happy he’s touring here in the US. Take a break from your dance practice and see Roger live in concert. Good luck with your shows in September! That sounds really cool that you got to see him live! Thanks for the well wishes!! !